The 26th May 1999 is forever etched in the memory of all Manchester United fans who witnessed events unfold at the Nou Camp. United, who had picked up a league and cup double the week previous, were trailing 1-0 to Bayern Munich. The dreams and hopes of a unique treble were fading in what was becoming a disappointing performance from Alex Ferguson’s men; that was until two substitutions that would change the face of the club forever. Jesper Blomqvist and Andy Cole vacated the field of play for Teddy Sheringham and Ole Gunnar Solskjaer to enter the fold. If Solskjaer is remembered for the knockout blow, it was Sheringham that delivered the sucker punch to give United the initiative. Teddy Sheringham’s career at Old Trafford was a little underwhelming to begin with, considering United had parted company with a certain Frenchman. Eric Cantona had retired from professional football, having captained United to another Premier League title. United fans knew that Sheringham had quality, but to replace Eric Cantona? That was another matter entirely. With the Brazilian Ronaldo, who was the hottest property in world football at the time, heading to Internazionale for £19.5million – it was fair to say that the £3.5million paid to Tottenham for the services of Sheringham didn’t attract the same noise. Sheringham’s first game on the opening day of the 1997/98 season was in on a familiar ground – White Hart Lane. The Spurs fans were of course not in a welcoming mood and rejoiced as Sheringham fluffed his lines on his league debut. United’s number ten missed a penalty, but was still on the winning side as the English champions ran out 2-0 winners. United’s new playmaker would have to wait another three games to open his account in United’s colours. A 2-0 win against Everton at Goodison, with the other goal coming from David Beckham, saw Sheringham bag his first goal but the season wasn’t to be a happy one for United. Sheringham showed his class in the first match against Arsenal, with two tidy finishes against his old enemy. It wasn’t enough though, with David Platt grabbing the winner in a thrilling 3-2 match. 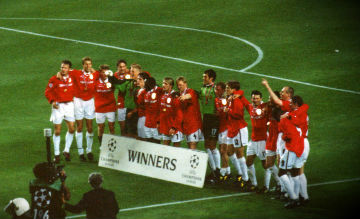 United were performing well in Europe, with a victory over Juventus – a club Alex Ferguson had described as “the benchmark” – and a fiery encounter away against Feyenoord, which United won 3-1, where Denis Irwin was on the receiving end of an X-rated tackle by Dutch international Paul Bosvelt. United were scoring goals for fun in the first half of Sheringham’s debut season, with handsome victories over Barnsley and Sheffield Wednesday at home, but the second half wasn’t to be as fruitful for Ferguson’s men. United were drawn against French side Monaco following an exceptional group stage performance, winning five out of six games and only narrowly losing to Juventus with a late 1-0 defeat in Turin. Monaco had a decent side, with ex-Celtic John Collin skippering combined with a young Thierry Henry and David Trezeguet in their ranks. The away leg was a dull affair, with Sheringham unable to beat Fabien Barthez in the Monaco goal. The return leg saw a thumping goal from Trezeguet at the Stretford End to give the French side the lead, however – Ole Gunnar Solskjaer equalized for the home side and United were pressing for a winner. Sadly, as experienced in 1993, United were eliminated on the away goals rule and Sheringham’s first taste of European Cup football had ended prematurely. United’s league form wasn’t much better – with defeats in the second half of the season against Southampton, Leicester City (at home) and Sheffield Wednesday, but the real hammer blow came in the final defeat of the season. United “welcomed” Arsenal to Old Trafford, knowing that a win would derail the growing momentum of the Londoner’s title bid – but knowing a loss would give the away side the initiative. Teddy Sheringham was in the starting line up and would receive the inevitable stick he would be subjected to in any fixture against Arsenal. It turned out to be Sheringham’s worst nightmare with Arsene Wenger’s side taking the game to the incumbent league champions. Marc Overmars ran riot on the left handside of the pitch, whilst Patrick Vieira and Emmanuel Petit formed a formidable partnership in the centre of the park. Overmars netted the winner, as Arsenal won the tie 1-0. They wouldn’t lose another game until be crowned Champions of England. In Sheringham’s first season at United he would end up empty handed, whilst his former North London rivals would win the double, their first since the 1970/71 season. United’s number ten would notch up fourteen goals in forty-two appearances, but it wasn’t enough as United finished a point behind Arsenal. Sheringham would depart United on England duty, where he would help the national team reach the last 16 of the tournament, which of course was overshadowed by an incident that would have an impact a team mate of Sheringham’s forever. If the 1997/98 season was one to forget, what was to follow would be beyond belief. One of the most remarkable qualities of Alex Ferguson throughout his time as Manchester United manager was the ability to react to a setback. Whether it be a loss, the departing of a player or the relinquishing of a title or cup; the manager always expected a reaction from the club. United bought big, bringing in the brilliant centre half Jaap Stam from PSV Eindhoven, the versatile Jesper Blomqvist (who had carved open United when playing for IFK Gothenburg in the 1994/95) and the extravagant Dwight Yorke from Aston Villa. The arrival of the latter would pose a problem for Sheringham as the Englishman found his chances limited. Andy Cole struck up a superb partnership with Yorke, with both players scoring 53 goals between them in all competitions. Sheringham would only make seven league starts and only two Champions League starts. If Sheringham’s debut season disintegrated in the final weeks of the campaign, the 1998/99 run would place him in Manchester United folklore. Sheringham would only score five goals in the whole of the season, but two of them would contribute towards two trophies. Sheringham played no part in the impressive 3-1, on aggregate, victory over an Internazionale side that boasted Ronaldo, Roberto Baggio and Diego Simeone – but he would see a goal ruled out for offside against Juventus in the semi-final before Ryan Giggs scored a late equaliser in a game that saw the Italian side put in an impressive display. He also sat out the epic 3-2 return victory in Turin, which saw Roy Keane, Dwight Yorke and finally Andy Cole score the goals in a game where United were two goals down within twenty minutes. If Sheringham was getting frustrated by his lack of playing time, he was about to enter the fold in some style. Before the Juventus game, United played Arsenal in what would be the most memorable FA Cup semi-final of all time. Yorke and Cole started the dire 0-0 first game, but it was Sheringham and Solskjaer who started the replay. It was Sheringham who set up David Beckham for the opening goal but Dennis Bergkamp equalized through a deflected shot. Sheringham then witnessed skipper Roy Keane lunge in on Marc Overmars and was then sent off. United’s number ten was then immediately replaced by Paul Scholes, as Ferguson looked to cling on against a rampant Arsenal. Phil Neville fouled Ray Parlour in the box to give Bergkamp a chance to notch his second and send the Londoners to Wembley. Peter Schmeichel dived to his left and saved the Dutchman’s spot kick as United held on for extra time. The final ever goal scored in an FA Cup semi final was quite possible the greatest FA Cup goal of all time. Vieira played a lazy cross field pass from left to right, which was intercepted by Ryan Giggs. What followed was quite simply breathtaking as Giggs weaved in and out of Adams, Keown, Dixon and Vieira, before smashing the ball past David Seaman. Sheringham’s United had made it into the FA Cup final, which would be the second of three amazing games of football. Sheringham started the final game of the league campaign against his old side Tottenham Hotspur. It didn’t go to plan as Les Ferdinand opened the scoring early in the first half. United nerves were tested, however Beckham scored a great equalizer as the half drew to a close. Andy Cole replaced Sheringham at half time, which ironically – considering what was to follow in the next ten days – would set the tone for the remainder of the season; a goal scoring substitute. It was Cole’s cool finish that ensured United won the league title and the club looked towards Newcastle and Wembley. Alex Ferguson, who was on the cusp of greatness, started with Cole and Solskjaer up top; however it wouldn’t be long for Sheringham to get on to the Wembley turf. Captain Roy Keane, who would miss the Champions League final through injury, picked up an injury and had to be substituted for Sheringham. United’s early substitute opened the scoring with a neat finishing following a superb one two with Paul Scholes. It was indeed the same partnership that linked up for the second goal, this time roles reversed – with Sheringham providing the assist for Scholes who rifled in the second. United had picked up another trophy, but the biggest one was to be played out four days later. United’s last, which coincidentally was the first, European Cup final was in the May of 1968. Sir Matt Busby’s men beat Benfica 4-1, with a superb second goal from George Best to ensure United became the first English side to lift the European Cup. Fast forward thirty one years and Alex Ferguson was leading his men into battle, this time on foreign turf. Sheringham was again on the substitutes’ bench, with Andy Cole and Dwight Yorke, rightfully, leading the line after a glorious partnership throughout the campaign. United were totally dominated by the German champions, despite competing with them throughout the first two group games. Roy Keane and Paul Scholes were sorely missed as the magical Effenberg and industrious Jeremies ran the midfield, with Mario Basler terrorising down the right hand side. The Germans were without Giovane Élber, and therefore Carsten Jancker led the line. The forward was unlucky not to score with a less than elegant overhead kick, hitting United’s crossbar, whilst substitute Mehmet Scholl produced an exquisite chip over the helpless Peter Schmeichel. United were hanging on. Ferguson decided to bring on Sheringham and Solskjaer for Blomqvist and Cole respectively – for the final quarter of the match, which would be the manager’s finest hour. As the clock ticked past the ninety, the European Cup was brought out to be presented decked out in Bayern Munich’s colours. Legendary ex-German captain, Lothar Matthäus who had been substituted was already celebrating with the crowd as David Beckham set himself to take a corner. Well past normal time, the corner was whipped in – with goalkeeper Schmeichel causing a nuisance of himself in the opposing box. Dwight Yorke hurled the ball back in before it was cleared to the edge of the box, where Ryan Giggs was waiting. The Welshman hit scuffed shot, which thankfully fell into the path of the waiting Sheringham. United’s first substitute then help guide the ball past the helpless Kahn, who immediately shouted for offside, to give United a last gasp equalizer. In a season that was full of late drama, Sheringham had got United back into the game with the most important goal of his career. Fast forward two minutes and Solskjaer won a corner on the same side. United fans were in a buoyant mood and as Beckham delivered another corner, Sheringham flicked on at the near post for Solskjaer to win it for Manchester United. The treble was complete. Alex Ferguson, who would become Sir Alex Ferguson following the treble triumph, had completed a feat that has never been seen in England, nor has been seen since. Teddy Sheringham’s life would never be the same again following his performance in the 1999 European Cup final. That iconic image of United’s savior, arms aloft, clearly still bemused at to what he has just done will decorate the walls of Old Trafford forever more and be etched in the memories of United fans. Although there was no topping the success of 1998/99, Sheringham still had more trophies to win and goals to score. The 1999/00 season saw Sheringham play more football, but not add many to his previous goals total. He notched 6 goals in all competitions as United went on to win another league title and the Inter-Continental trophy against Palmeiras. However, he still found himself on the bench in the big matches – noticeably against Arsenal and Chelsea. With Andy Cole and Dwight Yorke’s partnership dwindling, it was Sheringham’s final season in 2000/01 that would prove to be his finest in terms of consistent performances. Sheringham scored a superb twenty one goals in all competitions as he played in over forty games for United. Sheringham wasn’t about goals – his superb football brain and intelligence ensured he could see passes others could not see and would supply the ammunition for more pacey players further up the pitch. It was this intelligence that ensured he would continue well into his forties at the top level. Sheringham scored in the 6-1 defeat of Arsenal, which is surely one his most fondest matches against his old rivals. Sheringham departed Old Trafford a hero. He was brought in as the successor to Eric Cantona, but left making his own mark on the club, winning the trophy Alex Ferguson’s most sought out trophy. United’s number ten scored forty-six goals in one hundred and fifty three appearances for the club. He did indeed, win the lot. Sheringham continued to play for England was part of the 2002 World Cup Finals squad, playing in the 1-0 victory over Argentina. He went back to Tottenham and played for another two seasons, before stints at Portsmouth, West Ham United and finally Colchester United. He is a keen poker player on the circuit and, although not the first sportsman to capitalise on the growing poker scene, is ranked in the top 250 within England. He made the final table in the €5,000 No Limit Hold’em Main Event in the EPT Vilamoura, finishing 5th out of a field of 384 players, winning €93,121. Sheringham was appointed, in May 2014, by West Ham United as an attacking coach. Many believe he was responsible in helping to change West Ham’s direct style of play, which led to a run of good form at the start of the 2014–15 season, earning striker Diafra Sakho the Premier League Player of the Month award in October 2014.